It seems like the street food trend taking over Australian cities isn’t going to disappear anytime soon. Gin Long Canteen is the latest Asian food eatery to jump on the band wagon and I couldn’t wait to check it out – especially since Nu Suandokmai (ex Goldenboy and Nu Thai) was taking temporary residence in the kitchen. But is this new eatery worth all the buzz? The large lofty space in North Adelaide’s O’Connell Street is a modern stylish take on an Asian style canteen. The open kitchen takes centre stage with a handful of covers available to perch and watch the masters at work. It’s a funky fit out full of exposed timber shelves, blonde wooden panelling and industrial style lighting. The service is hurried but friendly, giving hungry diners a welcoming reception. 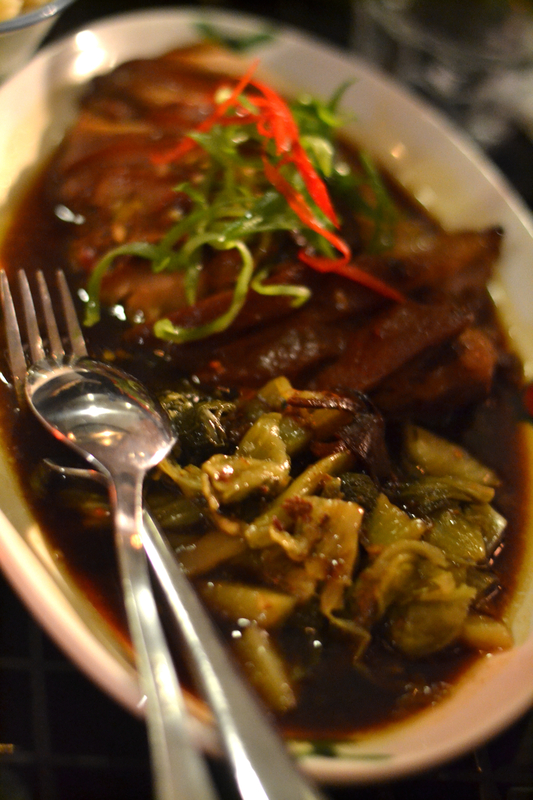 The menu is largely inspired by South East Asian hawker food, taking particular influences from Vietnam and Malaysia. You can choose from a selection of small plates to share or opt for one of their larger plates. The restaurant doesn’t take itself too seriously – tongue-in-cheek house wines are called “Shilaz” and “Liesling” and some dishes are described as ‘amazing’ which may deter the more seasoned food critic. On first impressions, it seems like Gin Long has really pushed the boundaries of fusion cuisine with desserts like creme caramel and chocolate mousse looking out-of-place on the Asian influenced menu. The food comes out fast and furiously. 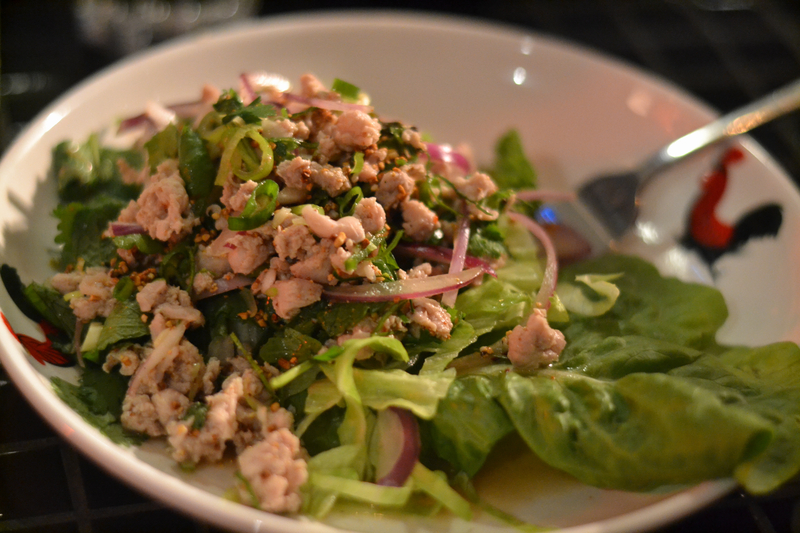 A big bowl of fragrant larb gai ($14) looked promising – fresh, colourful and full of flavour. Unfortunately my taste buds didn’t agree. The dish was over seasoned with spicy and zesty flavours fighting to take centre stage with the heavy-handed pouring of salt. Oh the salt!! The chicken itself was well cooked but the addition of toasted rice gave it a strange texture. 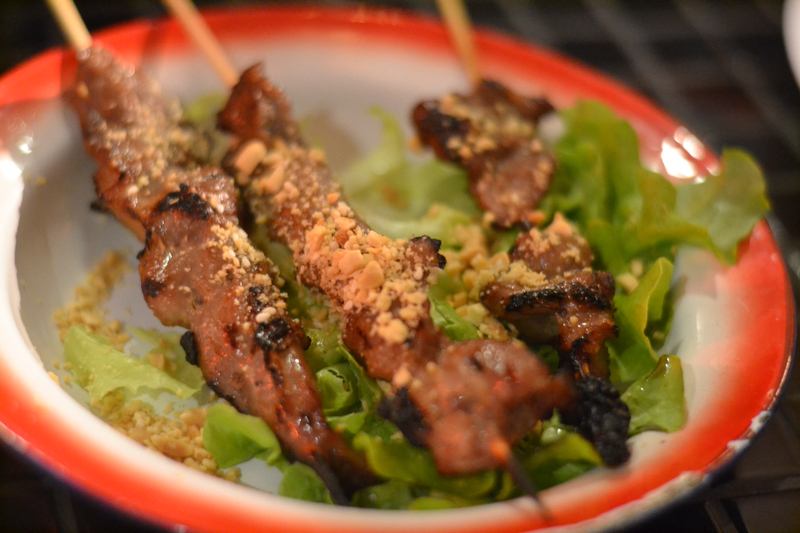 On the other hand, the pork neck skewers ($9.50) were beautifully executed – tender, succulent and grilled to perfection. Bathed in a sticky honey glaze with a subtle hint of galangal, the pork was finally topped with sesame and crushed peanuts which provided a lovely textural element to the dish. A beautifully crisp golden brioche was the next to arrive. 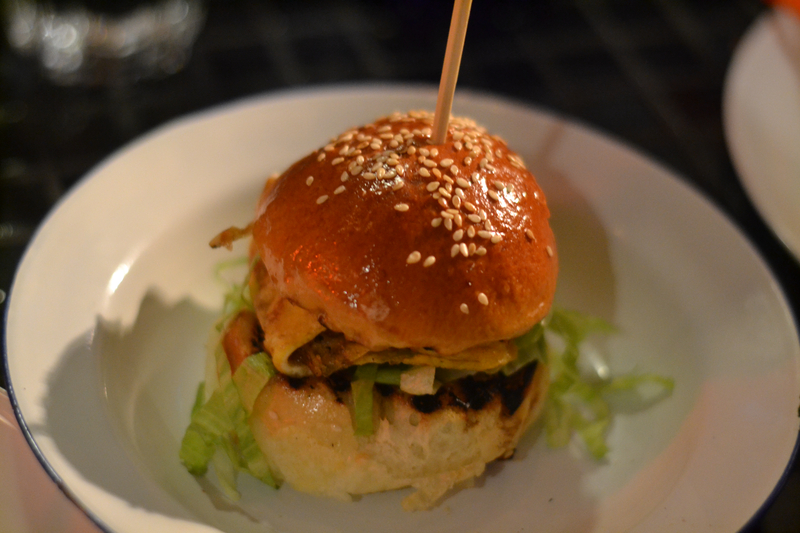 This was the Ramli Slider ($6) filled with a luscious filling of chicken, iceberg lettuce, egg and curried mayo. Despite it being just bite sized, the burger held its form beautifully and was not overly greasy. A trio of sugarcane prawns ($10) were beautifully presented on a bed of iceberg lettuce, shredded carrot, cold noodles and DIY rice paper rolls. I first tried sugarcane prawns in Vietnam and instantly fell in love. The prawns had a slightly crisp golden shell with a juicy centre. 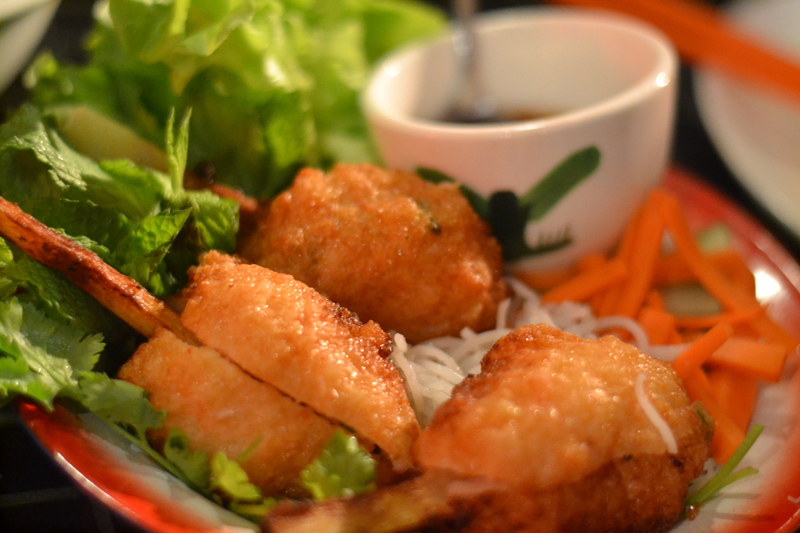 When wrapped in the rice paper and dipped in the peanut sauce the full flavour of the dish shone. Sugarcane gave the prawns a lovely infused sweetness. Don’t feel impolite to chew the sugarcane after to get the full flavour. 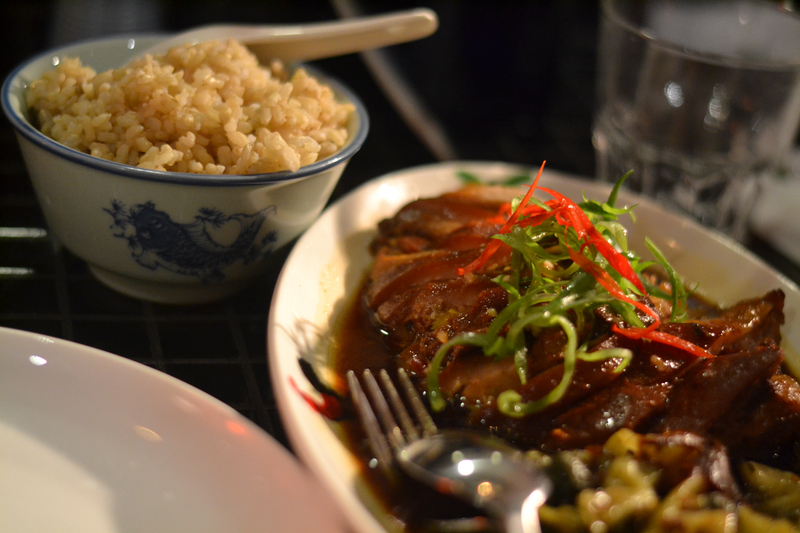 Finally we enjoyed a large plate of the “really” slow braised pork belly ($20) with a bowl of steamed brown rice. Generous chunks of succulent pork were bathed in a rich soy sauce and wilted bitter Chinese greens. The pork was slow braised enough to melt in your mouth but lacked the crispy skin I love of pork belly. Be warned, this dish is rich so is best enjoyed shared in smaller portions. Is Gin Long Canteen worth all the buzz? Probably not. I think they have taken the meaning of fusion food a little too far. I couldn’t bring myself to order a creme caramel in an Asian inspired restaurant. What happened to pandan cakes and rice puddings? 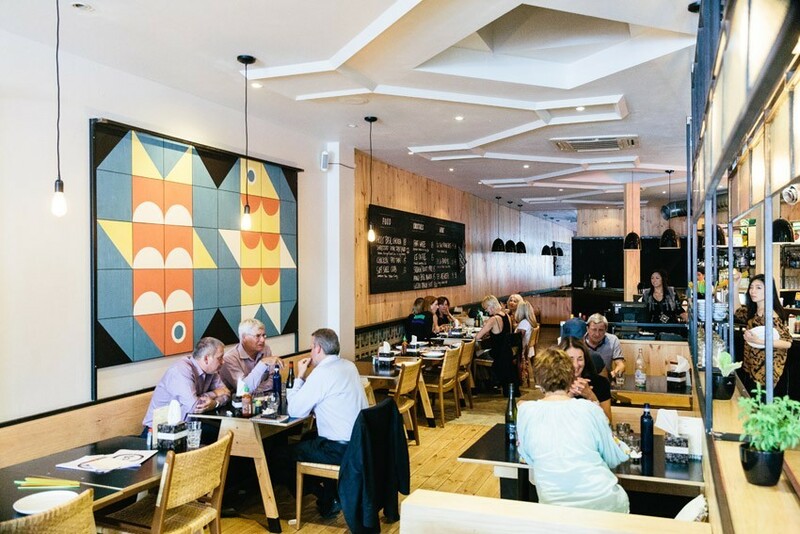 However it does serve up some winning dishes in a fun, buzzing atmosphere which is ideal for a large gathering. I am keen to return to try some of their other dishes. Approximately $40 per person for a selection of small and large plates, drinks and service.